How can collaborative and community-based approaches to research contribute to our capacity to care for and protect local and tribal heritage? Join Dr. Chip Colwell and panelists from the University of Washington, Burke Museum, and Confederated Tribes of Grand Ronde as they discuss how tribal nations and heritage managers are working together to care for and protect culture, history, and heritage. Workshop participants will learn strategies for developing successful partnerships and evaluate how to best integrate collaborative practice into their own work. Light lunch will be served. If you have any special dietary needs (e.g., vegetarian, gluten free, dairy free) please let us know as soon as possible by contacting us by email at preserve@uw.edu. Who owns the past? Museums that care for the objects of history or the communities whose ancestors made them? Five decades ago, Native American leaders launched a crusade against museums to reclaim their sacred objects and to rebury their kin. This controversy has exploded in recent years as hundreds of tribes have used a landmark federal law to recover their heritage from more than one thousand museums across America. Many still question how to balance the religious freedoms of Native Americans with the academic freedoms of American scientists, and the arguments continue on about whether the emptying of museum shelves elevates human rights or destroys humanity’s common heritage. 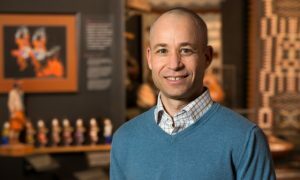 This talk presents a new book, Plundered Skulls and Stolen Spirits: Inside the Fight to Reclaim Native America’s Culture, a personal journey that illuminates how repatriation has transformed both American museums and Native communities. This story reveals why repatriation law has become an imperfect but necessary tool to resolve the collision of worldviews between scientists and Native Americans—to decide the nature of the sacred and the destiny of souls. *Thank you Dr.Chip Colwell, Briece Edwards, Dr. Sven Haakanson, and attendees for a great workshop!